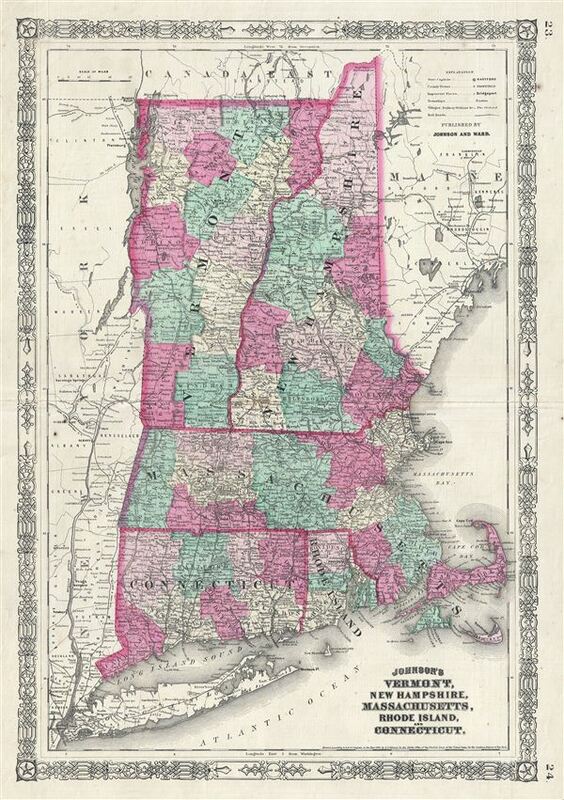 This is a beautiful example of Johnson and Ward's 1864 map of New england. The map covers the New england region from Long Island to Main and from the Hudson Valley to the Atlantic seaboard. Various towns, cities, railways, roads, rivers and several other topographical features are noted with relief shown by hachure. It features the fretwork style border common to Johnson's atlas work from 1864 to 1869. Published by A. J. Johnson and Ward as plate nos. 23 and 24 in the 1865 edition of Johnson's New Illustrated Family Atlas. This is the first edition of the Johnson Atlas to be attributed to Johnson exclusively. Very good. Minor toning and verso repair along original centerfold. Text on verso. Rumsey 0535.018. Philips (atlases) 4345.